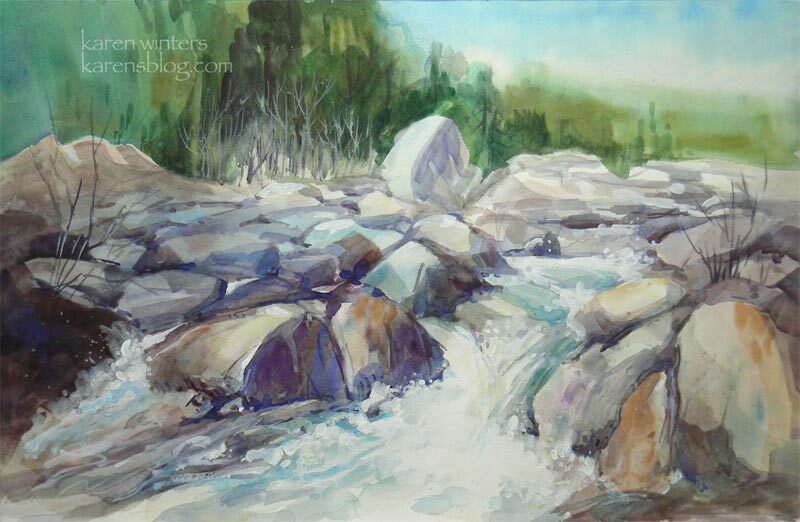 One of the most frequent questions I get about my paintings is whether they are all done plein air style (no) and, if not, what I use for reference. Although I do use photos to catch specific details of trees and structures, especially when painting architecture, one of my most valuable tools is my sketchbook. 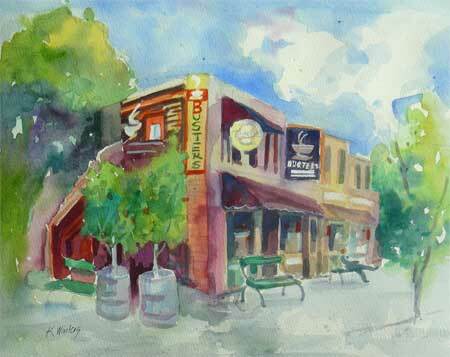 Because my roots are in watercolor, I usually do plein air sketches using that medium. 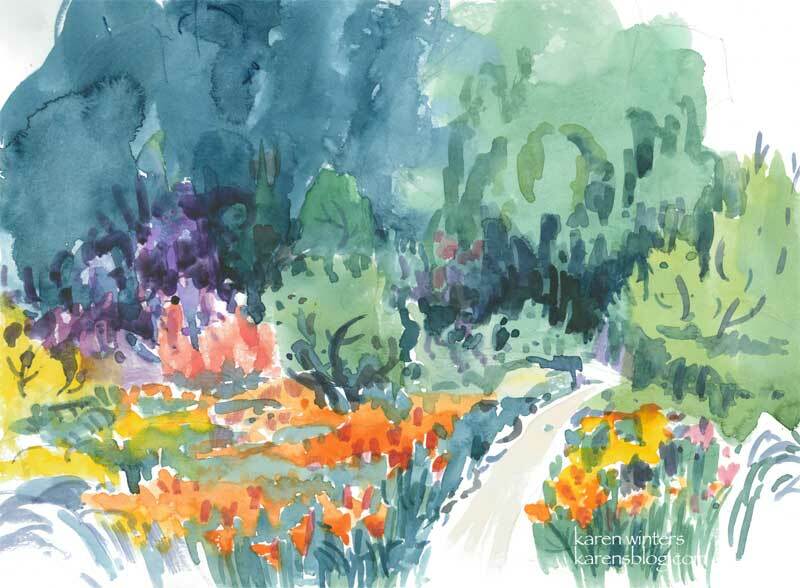 This is a quick way to get color notes and the general layout of a landscape subject without having to fuss with too much detail. Using watercolor as a plein air medium has a long history among 19th century painters, and noteworthy is John Constable. 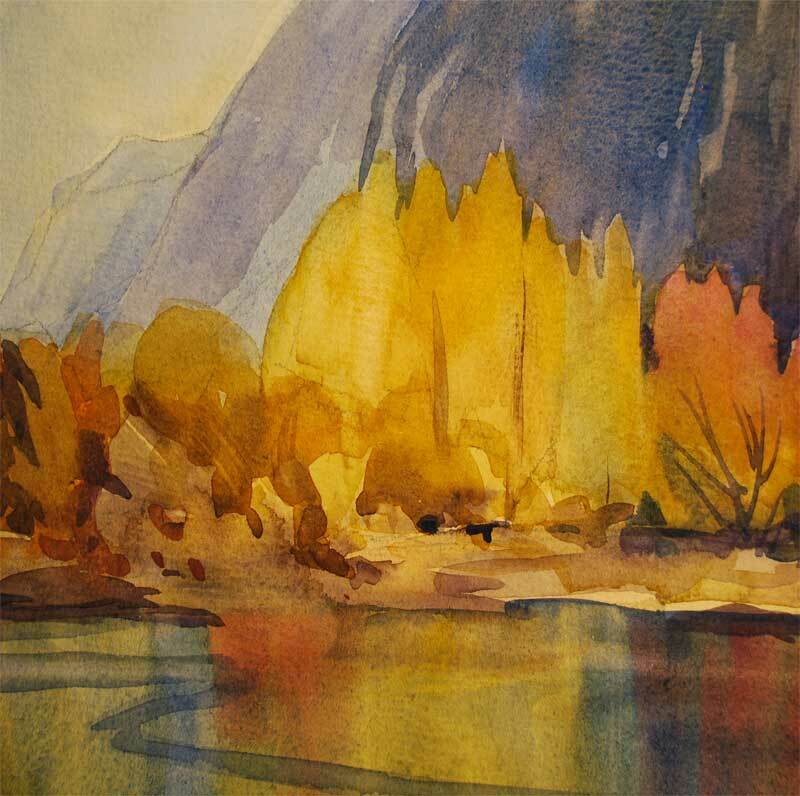 His field work formed the basis for his later oil paintings. Eugene Delacroix followed the same practice. 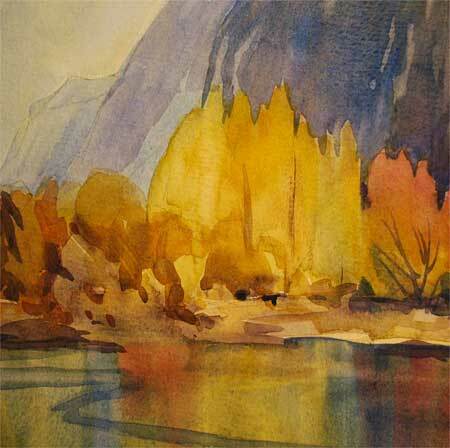 Watercolor painting has the benefit of being quick and portable, and it is a good way to capture the mood with few strokes. Although I love plein air oil painting and do it as often as I can, it’s not always easy to set up an easel. 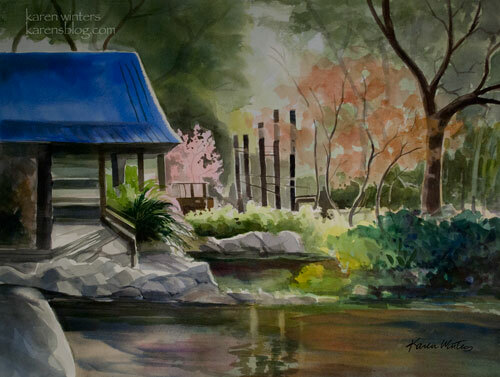 But a watercolor sketchbook can be opened and put to use in a few minutes. A portable watercolor palette, a spray bottle, a collapsible water bucket and a few brushes, some paper towels and I’m good to go. And I can carry a kit in the car so it’s handy at any opportunity. This is the third painting that I submitted for the Rialto Visions benefit art show and sale, proceeds of which will help restore the Rialto Theater on Fair Oaks Avenue in South Pasadena. Buster’s is a favorite hangout of ours when we’re in South Pasadena. Not only do they have great coffee and the small neighborhood atmosphere you can’t find in the ubiquitous ChainBucks stores, but they sell Fosselman’s ice cream, which is truly wonderful. It’s sort of like the Cheers of coffeehouses – you always run into someone you know when you go there. About 100 paintings were submitted for the show. Tonight at 7 pm, there’s a Collector’s Preview at the South Pasadena Library Community Room on El Centro Street. The $25 admission fee (for non-participating artists) will help support the theater’s restoration. Come meet the artists and see a lot of art, fresh off the easel. This Saturday, October 4, please join me at The Marengo Collection on 494 S. Marengo Ave. in Pasadena from 2-6 pm for the opening of the 25th annual Day of the Dead event, jointly presented by The Folk Tree and the Marengo Collection. 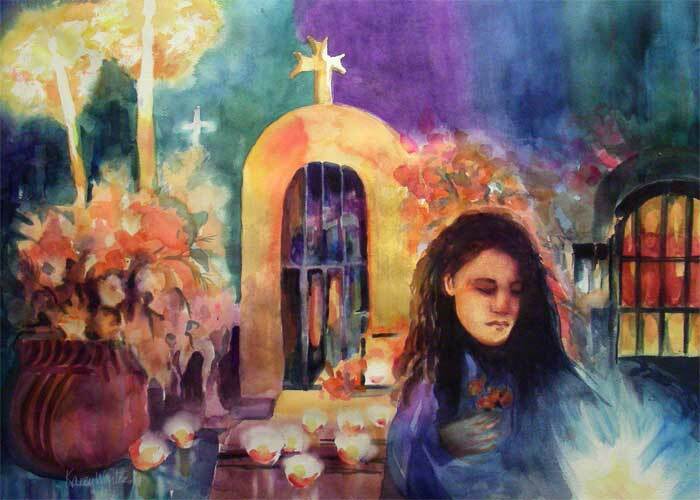 This painting “My offering – my confession” will be on display at the Marengo Collection for the month leading up to El Dia de Los Muertos, concluding Nov 2. Today, our local newspaper, The La Canada Valley Sun, did an Entertainment Section feature on me and the artwork, and I’m absolutely thrilled! Come see me this weekend if you’re in the Pasadena area. I’ll be bringing more than 40 original oil paintings and watercolors, plus some prints and cards. The park is shady so don’t let the weather keep you away! If you love art you won’t want to miss this once a year event! Yesterday I got the very good news that this painting (and an oil painting landscape, which I will post soon) has been accepted into the next California Art Club show at the Women’s City Club in Pasadena. The show will run for six months beginning Saturday, June 23 with an artists’ reception on July 12. I am absolutely thrilled to have this portrait included. The theme of the show is Natural Beauty and I love the look of beauty and strength in her face, which I attempted to capture in transparent watercolor. 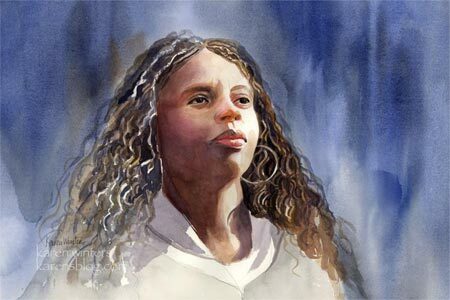 I found it challenging to paint African-American skin tones because there is such a wide range of values. The light-struck side of her face is quite pale, but the deep shadowed side is rich with color. Making the transition work was the objective, without resorting to using many small brushstrokes and ‘overworking’ it. Her beautiful wavy hair was the most fun to paint as I used negative painting to separate the tendrils. I chose a blue background for this lovely woman because I thought the blue would be a good complement to the rich warm browns of her complexion. Her garment was left understated as all the attention is really on her face. Well, that’s about all I can think to say about it, but if you have any questions about it, please feel free to ask. 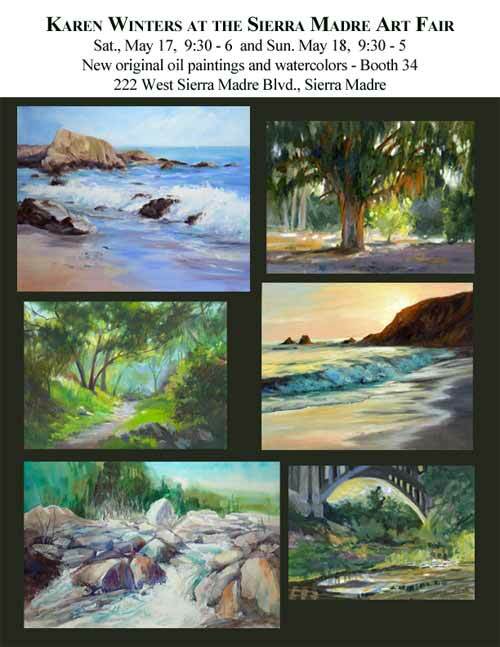 And don’t forget – this weekend … The Sierra Madre Art Fair in Sierra Madre’s Memorial Park 9:30 -6 Sat and 9:30-5 Sunday. It was inspired by a photo I took at the Anza Borrego State Park in N. San Diego County when we went there to look at the wildflower bloom several weeks ago (better make that months ago!) 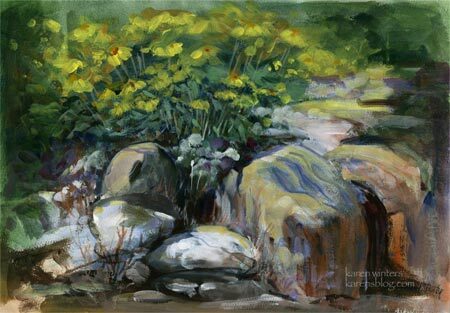 What attracted me to this scene was the contrast of textures – the hard rocks and the soft desert flowers, plus the contrast of shadows and bright sunlight. 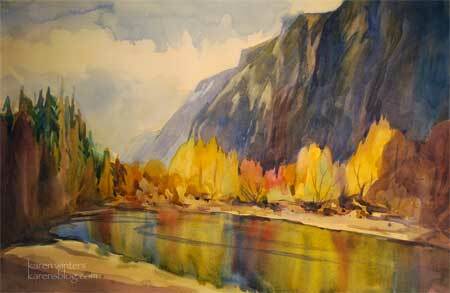 Right now I’m in final preparations for the Sierra Madre show. All of the pictures (more than 35!) are in their frames, although I don’t think I have enough space in my booth to display them all at once – so I’m going to have to make some hard choices. In addition I have a number of matted but unframed watercolors, like this one, which will be in a bin for people to look through. Well, today was the day from computer hell. Once in a very long time my Mac system gets corrupted and I need to reinstall system. However it got balky it now seems resolved. I painted this yesterday but didn’t have time to put any finishing touches on it until I got the puter back in order today. Many thanks to my dear husband for helping with the troubleshooting. This painting was inspired by the winter and spring rain we had at Eaton Canyon in Altadena (near Pasadena.) 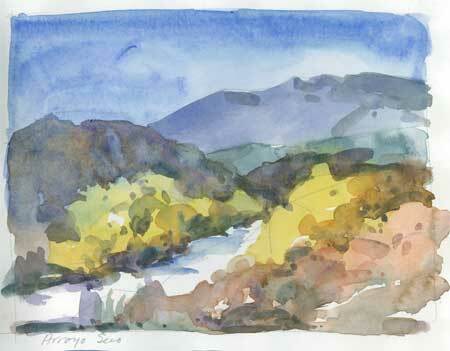 Although the water wasn’t deep it was abundant in the wide ravine and fun to paint. It’s another walk around the Arlington street poppy garden, but this time in a more decorative, somewhat abstract mood. I abandoned any attempt to be realistic and considered the landscape as a decorative tapestry, with different colors and textures woven through. With some modifications, this might scale up well into a larger painting. But then I’d have to fight the temptation to put in all sorts of fiddly realistic details. Can’t you just imagine Dorothy, Toto and the gang taking a nap back there between the poppies and the irises? We’re not in Kansas anymore. We’re in Pasadena.